We the undersigned activists, academicians, alumni, scholars, intellectuals, journalists, writers, teachers, lawyers, artists, filmmakers, students, researchers, professionals and other concerned citizens stand in solidarity with the agitating students and scholars across the four campuses of Tata Institute of Social Sciences. Education is the medium to attain the highest order of human wisdom. All education, including streams of pure and social sciences should mandatorily be non-discriminatory and accessible for all citizens in all ways across the globe. As an institutional mechanism, education should directly or indirectly, serve the interest of furthering non-discriminatory practices, human rights, irrespective of class, caste, gender, race, ethnicity, religious or sexual orientation or physical or mental disability. Thus one could come to point that the purpose of all education is to sensitise, to humanise, to take humanity to higher levels of knowledge, awareness, freedom and social responsibility. However the story in hand has something different to tell. Students across the four campuses of Tata Institute of Social Sciences (TISS) in Mumbai, Tuljapur, Hyderabad and Gawahati had gone on strike since February 21, 2018. All classes remained empty since then. While the issues around student aid have been raised for more than a year now, the last few days have seen large-scale protests at all TISS campuses. In 2016, what initially began as the struggle of some students from Dalit-Adivasi sections in TISS has over time become a mass protest. The student union of TISS has called for a complete boycott of lectures, field work, assignment and even examination. This is the first time that students’ union has backed any dissent from the students belonging to the deprived category. This time the protest began simultaneously on February 21 at all four TISS campuses – Mumbai, Tuljapur, Hyderabad and Guwahati – against the institute’s decision to stop student aid to those belonging to Scheduled Castes (SC), Scheduled Tribes (ST) and Other Backward Classes (OBC) from 2016 onwards. Reservation is a fundamental right as per Indian Constitution, which has been time and again under severe threat under the pretext of merit and upper caste demand. Reservation in the educational institutions and the financial assistance in the form of scholarships and freeships constitute perhaps the most important factor in the development scheme for people from historically oppressed, marginalised and exploited background. For, it is primarily responsible to make the basic input of education available to them. Without education, all the constitutional safeguards including the reservation in services would be infructuous. The Reforms have already resulted in freezing the grants to many institutions and in stagnating, if not lowering, the expenditure on education. The free market ethos has entered the educational sphere in a big way. Commercialisation of education is no more a mere rhetoric; it is now an established fact. Commercial institutions offering specialised education signifying the essential input from utilitarian viewpoint have come up in a big way from cities to small towns. Their product-prices are not only based on the demand-supply consideration in their market segment but also are manipulated by their promotional strategies. In a true spirit of globalisation, many foreign universities have already invaded the educational spheres through hitherto unfamiliar strategic alliances with non-descript commercial agencies, of course at hefty dollar equivalent prices. TISS students had undergone a difficult phase for the past half a decade, more specifically in the last two years. This is in particular with the question of accessing the benefits under reservation. One after another social groups were targeted which has now reached a standstill state. Established by the Union government’s Ministry of Social Justice and Empowerment, the post-matriculation scholarship scheme has long been the economic spine that has supported students from marginalised communities who venture into higher education. These funds helped the students from socially backward and economically weaker sections to overcome the hurdle of increasing tuition fees, hostel cost and dining hall charges at the institute, which would have otherwise made it difficult for them to continue their studies. This scheme is now in jeopardy. The apathy of the previous Congress-led United Progressive Alliance government has been exacerbated by the present Bharatiya Janata Party regime. At the beginning of the 2017 academic year, the TISS administration suddenly announced that it would charge dining hall and hostel fees from everyone – including the Government of India-Post Matriculation Scholarship (GOI-PMS) students belonging to SC and ST categories. According to this circular, the students who were then in the second year of the two years masters programme also had to pay. Though this issue has been consistently in debate since 2010 onwards in some form or other, it came up in a big way during the present Modi regime, when it began to target the scholarship to student from specific social groups. In 2015, the institute withdrew financial aid to students belonging to the Other Backward Classes (OBC) (non-creamy layer), and statistics shows that the representation of OBCs in the institute has taken a hit. About six months ago, a delegation of SC, ST and OBC students had met the minister of state for social justice and empowerment, Ramdas Athawale, and discussed their issues in detail. In this meeting, we were assured that our issues would be taken up on a priority basis and we would not be made to pay. While that conversation is still on, the institute went ahead with exerting pressure and demanding fees from the students. Most students will have to drop out if the administration does not relent. TISS has been on target for a longer period. Apart from the withdrawal of scholarship for the OBC student – which the TISS administration accounted it to be the fault of the government – there are several other instances of targeting student from Adivasi sections. In 2015, the name of TISS was deleted from the online application procedure for students belonging to ST category doing their MPhil and PhD programmes. The fellowship original known as Rajeev Gandhi National Fellowship for ST students (RGNF) was renamed as National Fellowship for Higher Education of ST Students (NFST). In the online list, the name of TISS was missing from the list of eligible institutions. Priyanka Sandilya one of the Adivasi PhD scholars went on to write to the Jual Oram, the Minister of Tribal Affairs (MoTA) and to the Chairperson of National Commission for Scheduled Tribe (NCST). She wrote, ‘all the four campuses of TISS (Mumbai, Tuljapur, Hyderabad and Gawhati) has been dropped from the national list, leaving them to loose their constitutional rights to avail scholarships.’ She refers to the pattern of prohibiting Adivasi scholars from some particular institutions like TISS to apply for legitimate scholarship. With the removal of TISS from the UGC’s list, many Adivasi Scholars enrolled for doctoral studies at TISS have been left staggering without any support. It could be seen that this has been a trend in the neo-liberal phase of Indian economy where the most marginalised ones are the first victims of this development politics, particularly in the field of education. It is under these compulsions that the students’ current movement in TISS attains importance and relevance. The demands are genuine by all legal and logical measure upheld by the Constitution of India. Another trend has crept since 2014. The University Grand Commission (UGC) has sent circulars to many universities including TISS demanding the details of students from particular sections. This was done at the behest of Ministry of Human Resource Development (MHRD). These include Adivasis, Dalits, Muslim minorities and those who are part of communist or communist-like students’ organisations. This highly confidential circular to the Vice Chancellors demanded for their addresses, photographs, courses undertaken with the particular university, parental details, etc. The right wing government wants to completely wipe of any sort of dissent against it’s regime and has put in place all sorts of systems against those who resist the anti-people policies of the government. In a way it is to trap students into a cobweb and stamp them as terrorists, extremists and anti-nationals. Many students from these sections were under severe threat for being from these social groups. There are many circumstances where the students and scholars are no more the free-beings within university premises. Universities are the global spaces where free mind and free thinking are developed. It goes beyond the state’s notion of academics and also engages with the society in a critical manner. In this way the delimitation of spaces for the evolution and development of free minds and spaces put forth an array of critical questions on the very notion of scientific approach and free thinking of the university spaces. Third, one of the most critical schools/centres in all Indian university have been notified for a closure. The School/Centre for Study of Social Exclusion and Inclusive Policy (CSSEIP) in all the universities are supposed to close down including TISS. This has been one of the most critical schools/ centres with critical outlook on socio-economic, cultural and political systems, particularly the continuity of disparities based on caste, class, ethnicity, gender, racial, religious, regional and sexual orientation. The students, scholars and faculty members are already under the threat of loosing these space in terms of education as well as employment. 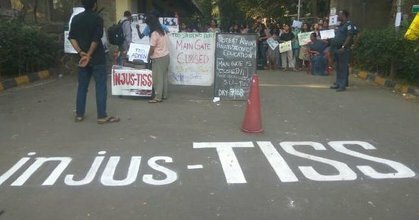 The students in TISS are creating a new history with such a long strike that has never happened in the past. Their fight is not just against the TISS administration, but at large against the system that deprives and discriminates student alongwith their family members from accessing the benefits of reservation. It is a fight against the systemic reinstatement of caste system under the aegis of Hindutva. It is to be kept in mind that for the past three years, all progressive, democratic and secular spaces are consistently under threat, more specifically within the educational and academic sector. Within the Indian campuses there has been a war-like situation among the students groups over the past few years, particularly with that of the right wing ideology. Excessive attempts have been made to completely saffronise the educational curriculum, syllabus and other aspects, which the students across the country have resisted strongly. Under these contexts the demands put forth by the students of TISS attains not just importance within the institute but also national and international relevance on how scientific thought processes are completely blocked. Reinstatement of freeship/ scholarship for Dalit (SC), Adivasi (ST) and OBC (non-creamy layer) students under reservation policy. Nationally bring an end to policies undermining Social Justice. Stop privatisation of education and educational institutions across India. While at one end there is a lack of allocation of funds from the Central Finance Ministry, on the other, the funds under SC sub-plan and ST sub-plan have been consistently diverted or underutilised in most of the states. Some media reports indicate that the funds allocated in the Adivasi dominant states, such as Chhattisgarh, Jharkhand and Odisha, have not been able to spend their fund allocation beyond 11 percent. Few reports suggest that money for educational support under pre and post matric scholarship were diverted into the anti-insurgency operations in constructing roads, deployment of security forces and their subsidiary expenditures. The state governments have been playing a big foul play in this entire display. There are clear cases of fund underutilisation. For instance a student from Chhattisgarh studying in TISS would get only Rs. 7500/- as fees annually for doing a course in the institution, while the fees is almost a lakh rupees. The argument placed is pretty mindless, beyond any rational imagination. According to this argument, a student studying in TISS is eligible to avail only the amount, at par with another student from his or her home district, doing a similar course in a local government college. This means that if a student from Bastar studies in TISS, his course cost would be only the fees that another student from Bastar has to pay. The government authorities argue that this would prevent “discrimination’ in fund allocation for other students. There cannot be a special category of ‘premier’ and ‘non-premier’ institutions. All are being treated “equal” is the best argument. Perhaps if a student gets admission for MA in New York University, then he or she has to take Rs. 7500/- annually as the course fee. It has remained the same with most of the states, where the students from SC, ST and OBC category are treated as beggars on whom the government is doing some sort of a charity. The Punjab and Haryana High Court has come up with a clear verdict that the government should release the total amounts of fees to the students belonging to SC category including tuition fees, hostel fees, mess fees and any other eligible fees charged by the institution. It has also added that the students should be also assisted by a decent living cost. This means the ‘non-discriminatory’ argument of Chhattisgarh government does not have a locus standi. Such a situation of non-deliverance of substantial monetary assistance, despite being allocated from the centre, has already led institutions like TISS into a perennial debt trap. But TISS has never figured out the ways and means to come out of it. It would have been better had it supported the students cause by engaging in a negotiation with the government bodies and ministries. Instead of doing anything such the institution, in turn has put more pressure on the students to bring more money from their homes. Take immediate action to reinstate the post-matric scholarship meant for students from different marginalised sections. TISS administration should stop harassment of students by instant pressure tactics of fees hike. Both the central and state governments should take adequate steps to immediately release the funds and backlogs to premier institutions like TISS. The state governments should stop comparing TISS with colleges in the local area. Stop spreading hatred in the campuses and politicising the students on caste, religious, ethnicity, gender, class and regional factors. Release the backlog fund for the welfare of the students from weaker sections of Indian society across universities of India. Uphold the space for scientific and rationale though development, freedom of individuals and in understanding the nuances of society in a critical manner. Stop the attempts to saffronise educational institutions and campuses. Reinstate the Schools and Centres on Study of Social Exclusion and Inclusive Policy. Ensure the fulfilment of constitutional and democratic rights of students from SC, ST, OBC, Minority and other special categories. Freny Manecksha, Independent Journalist, Mumbai, Maharashtra, India. Laurence Davis, College Lecturer, Department of Government and Politics, University College Cork, Cork, Ireland. India’s Partition and Kashmir Imbroglio - Who is responsible?